Powerful, flexible and fun, Phalanx is Vengeance's best yet - add in a MIDI pad controller and beat-making nirvana awaits. Feature-packed but not complex. Browser tagging is simple yet effective. Customisable interface Large library of quality samples. Flexible effects engine. Immediacy of results. 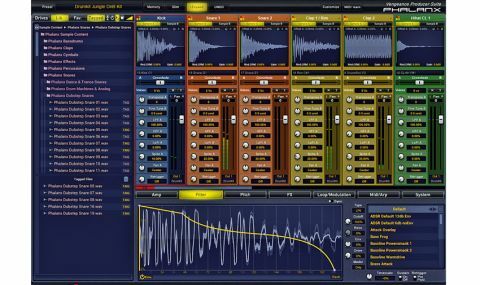 Vengeance-Sound's Phalanx (VST/AU/RTAS/ AAX, requires eLicenser dongle) is the latest in its Vengeance Producer Series (VPS) range and it is, in essence, a sample player primarily designed for working with drums and loops. So while Vengeance bills Phalanx as a "drum and synth sampler", it's very much a drum sampler à la NI Battery or FXpansion Geist as opposed to a full-on multisampling Kontakt-style sampler. The plugin provides a set of 16 mixer-channel- like "sample pads", each one bussable to one of 16 audio outputs in the host DAW mixer. "The sounds themselves are of a consistently high quality and in keeping with Phalanx' core purpose are largely made-up of drum hits"
There are two versions of Phalanx: The standard edition comes with a library of 3000 samples, whilst the Premium edition has 6000 (functionality is otherwise identical). The sounds themselves are of a consistently high quality and in keeping with Phalanx' core purpose are largely made-up of drum hits, although there are also some effects, synth stabs and such-like. Stylistically, Phalanx' library is geared towards dance music (in its myriad forms). Naturally, you can load your own samples too. Samples are assigned to each pad by drag- and-drop from an integrated browser with a neat trick up its sleeve: every sample has its own Tag button that can be toggled on and off with a click. When the Tagged option is active at the top of the browser, all your tagged samples are shown in a second listing below, giving a great way to shortlist a set of 'possibles' when choosing the sample for your latest opus. Each pad can have up to two samples - A and B - loaded into it, making it possible to load up to 32 samples into a single instance of Phalanx. Each instance of the plugin is 256-note polyphonic, so while extensive simultaneous retriggering of many multilayered pads could result in a bit of note-stealing, it should be a rare occurrence. Phalanx features three view modes. In Standard view, the channel strips of only six pads can be seen on screen simultaneously. When operating in this view, each pad shows its general mixer controls (A/B crossfade, pan, volume fader, mute, solo) alongside a set of sample-specific parameters for each of the two samples loaded into it. These controls enable a fairly standard array of operations and manipulations to be carried out: pitch adjustment, low- and high-pass filtering, mashing samples through a lo-fi effect (a combined sample-rate reducer and bitcrusher), enhancing the attack transient, setting the pan position, and setting a retrigger rate for the sample. The last controls the speed at which the sample will repeat when you hold down a note/ pad on your MIDI controller. The rate can be set from just under half a second all the way down to 0.5ms, and with very rapid retriggering, the source sample effectively becomes the basis for a pitched waveform, enabling interesting new sounds to be created. Switching to the Expand view causes the sample-specific controls to condense, creating a blank area at the bottom of each pad's channel strip into which you can drag control knobs from the Editor panel to make your own custom set of knobs. Each pad can have up to four Editor controls added to its channel-strip. The third view mode, Slim, lets you see all 16 pads simultaneously, but with only the main mix controls for each one visible. Being heavily drum-orientated but not wanting to exclude other types of source material, of course, MIDI triggering flexibility is a crucial area of Phalanx, and to cover it, two MIDI control modes are available. In Multitrack mode (which we reckon should be called "multitimbral mode", since that would describe it literally), each pad is assigned to a MIDI channel, with its sample(s) pitched across the keyboard - ideal for melodic sounds or when you require direct pitch control over drum sounds, etc. In DrumKit mode, all pads operate on the same MIDI channel, with each one assigned to a MIDI note number. Phalanx features two high-precision anti- aliasing modes - Normal and High - that are particularly useful when working with pitched samples in Multitrack mode. The aim is to rid Phalanx of aliasing - nasty sonic artifacts that are inherent in digital audio systems - when transposing pitched samples by significant amounts. The High setting places the biggest strain on the host computer, but typically, when working with drum sounds, the anti-aliasing filter isn't needed and can simply be disabled. Phalanx is capable of mapping individual samples across the whole keyboard, making it possible to use it for playing pitched parts, though its abilities in this area are limited. Full- on multisampling isn't possible (although key velocity can be mapped to the A-B crossfade for a two-level multisample), and it isn't possible to assign a sample to a specific key-range - samples are assigned to a single note or across the entire note range. Phalanx' true raison d'être is to work with single-layer samples and loops, at which it excels. "It's richly featured without becoming overly complex or impenetrable"
Vengeance has clearly thought long and hard about what's called for with a sample player of this ilk, and in so doing has created something that is more evolution than revolution. The included sample library is extensive and of high quality throughout, and finding the needle you're looking for in this vast haystack is made easier thanks to the browser's clever tag system - a simple yet phenomenally effective feature. Phalanx is a very flexible, well-executed instrument in terms of both its interface design and its range of musical uses. It's richly featured without becoming overly complex or impenetrable - quite the opposite in fact: coupled with a MIDI pad controller, Phalanx bridges the divide between the hands-on tactility of Akai's MPC series workstations and the multifaceted adaptability of a DAW - no mean feat.